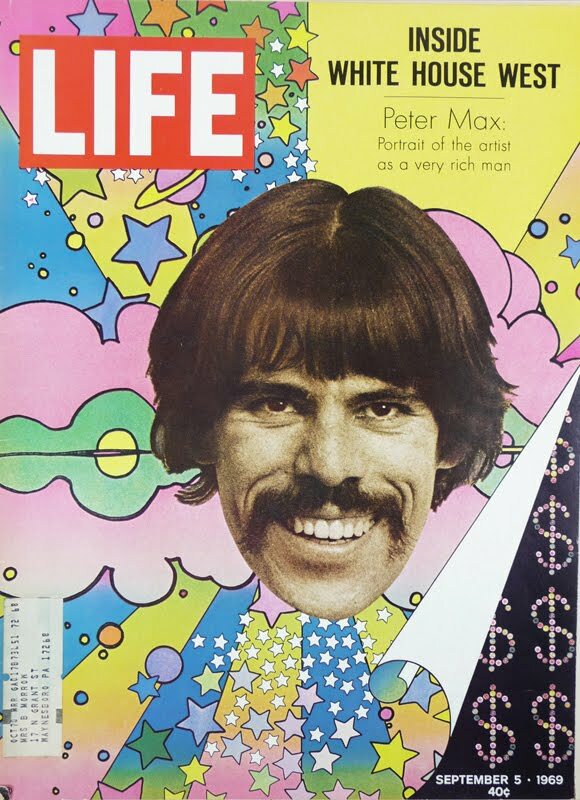 To people of a certain age, the name Peter Max means something. Back in the mid-1960s, Max’s fame was such that he was getting credit for things he didn’t do. When the Beatles’ Yellow Submarine, the movie, came out, Max’s influence was such that people automatically credited him with the neon-lighted animation of the film. Max said he recommended they get in touch with Heinz Edelmann, and Edelmann got the job. But the general assumption that Max designed the art for the film persisted and is frequently “debunked” by people who write about such things, often with a vociferous dismissal of Peter Max, as if he made the claim himself. It’s hard to imagine Max needing to take credit for the movie. By the time the movie came and went, Max had become the best selling artist in the world, with millions of his DayGlo-colored posters adorning dorm rooms, head shops and coffee shops all over the world. At the height of his fame, Max was featured on the cover of Life magazine and had contracts with 72 separate corporations to produce graphics, logos and designs for clothing, mugs, cards and other objects. 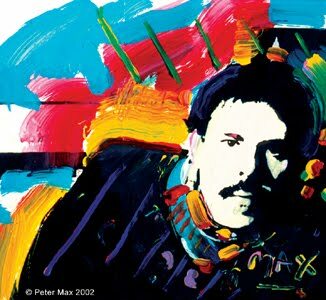 Peter Max was born in Berlin in 1937, but his family moved to China the next year and ultimately settled in Brooklyn. Max studied at the Art Students League, the Pratt Institute and the School of Visual Arts, all in New York. After closing his design studio in 1964, Peter began creating his characteristic paintings and graphic prints, which he continues to create in his New York studio. “I have about 50 people who work for me, and I am busy all the time,” said the 74-years-old. But for most, Max will continue to be associated with the psychedelic hippie era of the 1960s and 1970s. Although not quite acquiring the cultural patina and astronomical auction prices of artists like Andy Warhol, Roy Liechtenstein or Robert Rauschenberg, people continue to value Max’s work, even though quite a few people think there is too much of Max’s art on the market. NOTE: the Max Collector does not necessarily share some of this review's content, but we believe in freedom of speech.